We’ve covered a lot of ground in the past two years. Here are the top twelve TransMagic articles from 2016/2017. Actually, it’s hard to measure what the top blogs were in any given year; do you count the number of views? In that case, older articles have a definite edge. Optimizing SOLIDWORKS Performance: SOLIDWORKS is still the clear leader in terms of existing MCAD seats, and is always a popular subject. 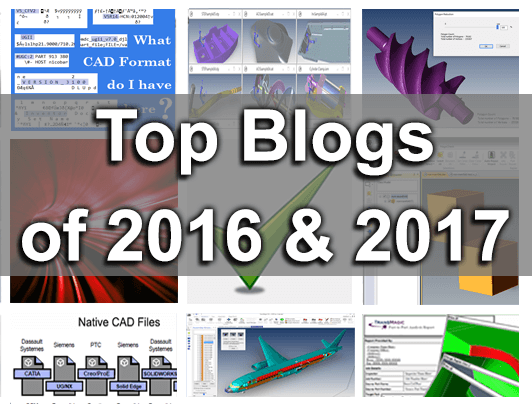 This article goes over several hardware and software suggestions for significantly improving SOLIDWORKS performance. Many TransMagic users may be unaware that our Pro and Expert versions come with a SOLIDWORKS PowerPack add-on, which enables you to use TransMagic translators and repair functionality right inside of SOLIDWORKS. What is Non-Manifold Geometry: Many users stumble upon the “non-manifold” issue; this article describes what it is, but we also have a more recent article that describes how to detect and repair non-manifold geometry. Free Sample CAD Files: Many users are not aware that there are dozens of free CAD files that come with TransMagic, which are useful for diagnostics as well as following along with demos or practicing. Tips for Working with Large CAD Files: Large CAD files and assemblies will continue to stretch the capabilities of our laptops and workstations for decades to come, but these tips should help. Related articles that might be of interest include the Where’s My CAD Data series. Six Reasons to Avoid IGES Files: If you do have IGES files, TransMagic will generally stitch them into watertight solids in the blink of an eye; but they can also present difficult problems, not just because IGES is primarily a surface format, but because often IGES files were created by poor quality IGES translators. Two related articles which might be of interest are Three Alternatives to IGES, and the CAD Format Ladder series, which presents a format hierarchy for CAD translation success. Polygon Reduction: Polygon Reduction is a popular topic because getting polygonal output to look good, yet remain a manageable file size is the name of the game. One other article that may be of interest if you are contemplating Polygon Reduction is Pre-Processing for Polygon Reduction. CAD and Polygonal Formats: This article summarizes what CAD and polygonal formats TransMagic will read and write. You may also be interested in learning more about what the differences are between Brep and Visrep formats, and the advantages of each; if so, check out Brep vs Visrep models. Six Reasons Watertight Models Matter: You can’t have a solid model unless it is watertight; this post explains some of that, but if you want to see a fairly complex example of making a leaky model watertight, check out How Fast Can You Repair CAD Geometry? Can I Convert Polygonal Models to CAD Models? The answer is yes, but be aware that the file size may become unwieldy. CAD Model Conversion Danse Virtual Reality: This is actually more of a case study, but we’re including it anyway. If you’re doing any CAD > Polygonal conversion work for animation or simulations, check this one out. How to Choose a CAD System: Built-In Applications: We did a whole series based on an original article by MCAD industry luminary Stephen Wolfe. #12. What CAD Format and Version is this? What CAD Format Do I Have Here? When you have a file and you aren’t sure what format it is, what CAD system it came from, or what version it is, check this article. Just knowing the format, and in some cases, the version, can make downstream applications or collaboration much more effective. And if you’re curious as to the best format to use when translating, check out this related article on the CAD Format Ladder. Speaking of top blog posts, are there any subjects you’d like us to cover in 2018? Drop us a line at social@TransMagic.com and let us know!